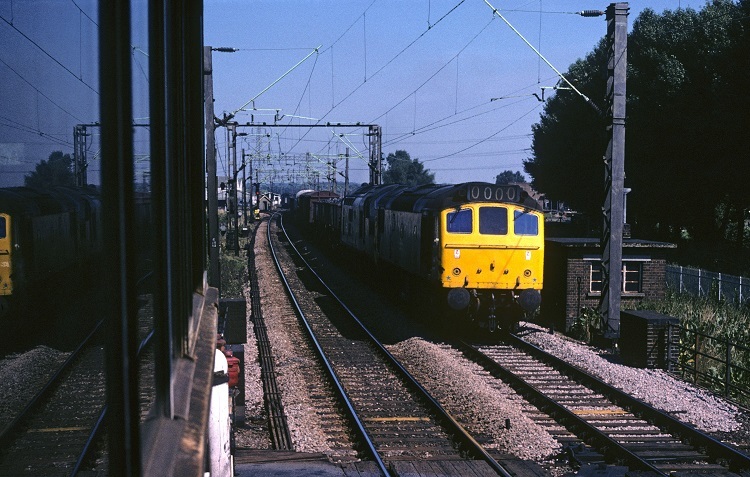 Photograph courtesy Roger Geach 25260 & 37019 at Broxbourne Junction on Tuesday August 28th 1979 with a Whitemoor - Temple Mills special freight. The sixteen year career of D7610/25260 started with eighteen months allocated to Eastern Region depots, followed by the remainder allocated to London Midland Region depots. Built BR Derby Locomotive Works. Time between last Classified repair and withdrawal: 89 months. Time between withdrawal & scrapping: 55 months. D7610 was new to the Tinsley (41A) on April 7th 1966. Further transfers were:p> December 1966 to Barrow Hill (41E). October 1967 Springs Branch (8F). January 1969 to Birmingham Division (D02). January 1971 to London Division (D01). May 1971 to Birmingham Division (D02). 25260 was the 158th Class 25 withdrawn, one of eight retired during December 1982. After withdrawal 25280 was stored at Etches Park from at least February 3rd 1983 to July 1985 and moved to Swindon Works on July 24th 1985. It survived the closure of the Works and was dragged across to Cocklebury Yard on June 3rd 1987 with 25093, 25126/134/161/164/180/193, 25207/208/260, 25306/327. It then moved to Humberstone Road, Leicester on June 5th 1987 with 25126/134/164 and into Vic Berry's yard three days later. It was broken up by the middle of July 1987. 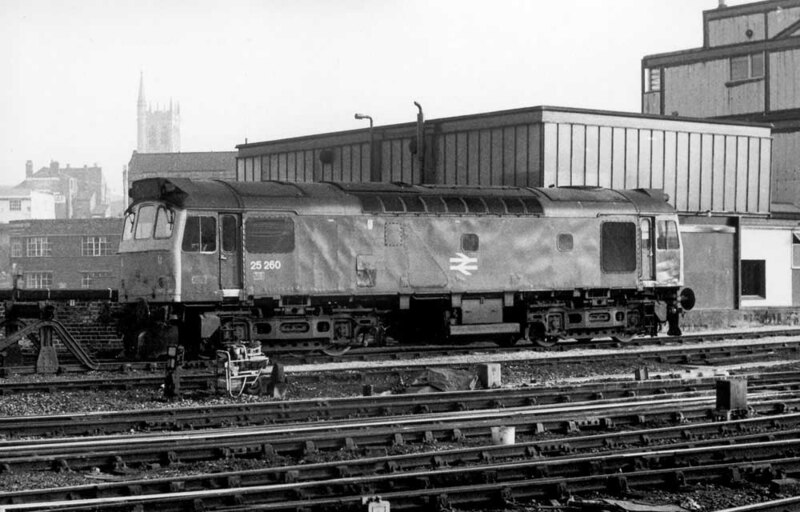 Photograph courtesy Adrian Healey 25260 at the arrival siding alongside Derby Works on February 3rd 1983. It would remain here until July 23rd 1985 when 45060 hauled 25093, 25105/164, 25234/248/260, 25312/319 as the 9X12 17.05 Derby Works - Swindon Works. Noted Derby Works July & September 1966. Noted Crewe Works March 1970. Noted Crewe Works June 1975 (Classified assumed, repainted into blue livery?). On June 16th a very clean D7610 was noted on a seven coach passenger service displaying headcode 1M89. On the afternoon of August 12th D7610 delivered the final AM11 Class 311 electric multiple unit No.110 for the Glasgow suburban system, being noted northbound over G&SW route. 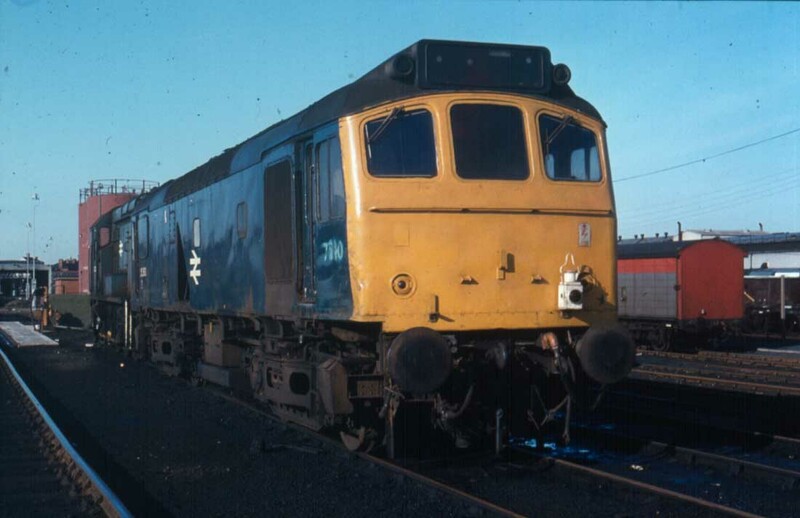 The early passenger workings for D7610 appear to have slipped unreported into the pages of history, such that the first known so far was an unidentified working on August 19th 1973 with 7610 & 5228 handling a passenger train between Dundee & Perth. Condition September: green livery with full yellow ends. The failure of a three-car multiple unit during the afternoon of November 14th saw 7610 assist the 13.50 Chester - Wolverhamptpn service. The return working, the 16.35 Wolverhampton - Shrewsbury was assisted by 7602. A lengthy run over the NE/SW route took place on August 9th with the 1V91 11.58 Newcastle - Paignton being worked by 25260 & 25136 (observed on train at Sheffield), for a passenger mileage of 370 miles, 47055 took over at Exter St Davids. Later this day the pair of Class 25s assisted 33032 on the 19.20 Exeter St. Davids - Basingstoke as far as Salisbury (assumed). On July 31st 25260 & 25272 worked the 10.07 Aberystwyth - Euston to Wolverhampton (assumed). On August 2nd 25260 worked the 18.39 Shewsbury - Aberystwyth and the next day's 15.10 Aberystwyth - Shrewsbury. On August 15th an Alfreton - New Hadley via Shrewsbury special was noted changing locomotives at Birmingham New Street with 47477 giving way to 25121 & 25260. During the third week of August 25260 had 'USS Enterprise' chalked in large letters on the non-BIS side, between the number and the BR emblem. The Walsall - Norwich (for Yarmouth) - Walsall passenger diagram was worked by 25260 & 25271 on June 18th. On July 3rd a Weston-super-Mare - Barmouth day excursion was worked from/to Wolverhampton - Barmouth by 25260 & 25323. The Walsall - Norwich (for Yarmouth) - Walsall passenger diagram was worked by 25260 & 25124 on August 27th. A Marylebone - Kidderminster day excursion on September 10th was worked out (via Bicester) and back (via Worcester/Oxford/Banbury/Bicester) by 25260 & 25253. On July 7th 25260 & 25302 went on a lengthy trip out & back with a Nottingham - Barry Island day excursion, for a total of 349 passenger miles. Near the month end on July 30th the 08.45 Birmingham New Street - Barmouth and the return 17.45 Barmouth - Euston to Wolverhampton were worked by 25260 & 25263. The last week of August was a busy one for 25260. On August 23rd it worked the 17.10 Cardiff - Crewe. Three days later (26th) 25260 & 25161 worked the 10.40 Euston - Aberystwyth from Wolverhampton, returning with the 16.10 Aberystwyth - Shrewsbury. On September 9th the 10.40 Euston - Aberystwyth from Wolverhampton and the 16.10 Aberystwyth - Shrewsbury were worked by 25260 & 25302. On May 28th 25260 worked a Worcester - Leeds passenger service. Its June 9th 1979 and 25260 is deep inside Toton shed as an organised visit for a group of enthusiasts takes place. The majority of the passenger workings for 25260 during 1980 involved Cambrian turns. On May 31st the 04.10 Shrewsbury - Aberystwyth and the return 10.07 Aberystwyth - Euston to Wolverhampton were worked by 25260 & 25267. The next day (June 1st), a Euston - Aberystwyth charter was worked roundtrip Wolverhampton - Aberystwyth by 25260 & 25261. As a change from Cambrian metals on June 13th 25260 & 25131 worked over the NE/SW route with the 13.34 Birmingham New Street - York and the 17.26 York - Birmingham New Street. On July 5th The 10.10 Euston - Aberystwyth from Birmingham New Street and the 16.10 Aberystwyth - Shrewsbury were worked by 25260 & 25269. 25260 was stabled at Saltley on January 10th, still displaying the '0000' headcode display. Photograph collection of webmaster Manchester Victoria 25260 no date. 25260 & 25272 were busy on the weekend on June 13th/14. On 13th they worked the 04.10 Shrewsbury - Aberystwyth, returning with the 10.07 Aberystwyth - Euston to Wolverhampton. The next day (14th) they worked the 08.45 Birmingham New Street - Aberystwyth and the return 18.00 Aberystwyth - Euston to Nuneaton. On July 15th 25260 was stabled at Walsall station. On July 27th 25260 worked a Swindon - Gloucester service. 25260 worked the 09.50 Manchester Victoria - Llandudno Town and the 14.20 Llandudno Town - Manchester Victoria on June 27th. 25260 was stabled at Springs Branch on July 10th. On August 20th 25260 worked the 17.30 Glasgow Central - Carlisle. A week later on August 28th 25260 & 25321 worked the 07.40 Euston - Aberystwyth from Wolverhampton, returning with the 14.00 Aberystwyth - Shrewsbury. On September 5th 25260 was stabled at Severn Tunnel Junction, the No.2 end still retaining a working four-digit headcode. 25260 was stabled at Banbury on October 23rd. 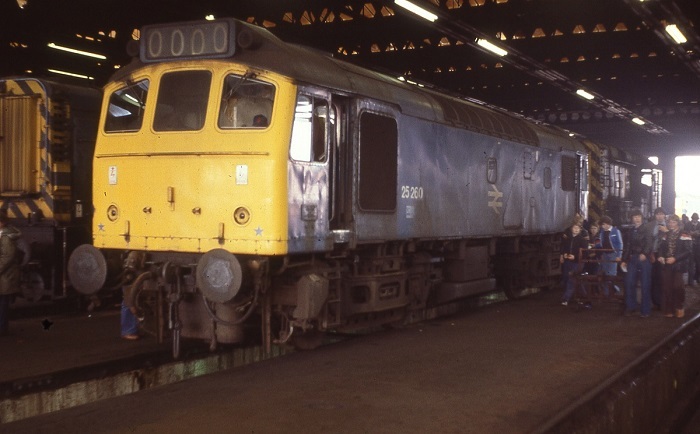 25260 was retired on December 13th 1982, but would not be scrapped for another four and a half years. Page added November 17th 2012. Last updated April 20th 2019.